Happy hour, that age old tradition of enjoying cocktails and laughter with friends to melt away to worries and woes of the workday. And if you're fortunate to have your own home wet bar, there is no better place to stage your very own happy hour. While you're busy entertaining your guests, let this custom wallpaper design wow your friends and family. This wallpaper design is a perfect fit for a wet bar, showcasing numerous varieties of glassware. 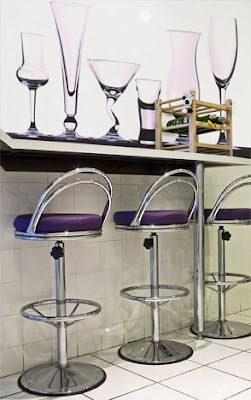 The glassware itself has been tinted, so the purple hue of the bar stools could be played off the wallpaper. The scale of the glassware in the wall mural will get your guests talking as well. Taking these normally smaller elements and exaggerating them to huge proportions is a clever way to maximize impact while still being completely unique. If you'd like to switch up the custom wallpaper design, we could create a pattern out of martini glasses instead of the glassware shown. Or play with the wallpaper's scale again, and go for a huge cocktail olive. With custom wallpaper options as varied and unique as cocktails, contact us to learn more about decorating your wet bar.